An elegant design that has a high build quality. Meaningful, if few, color variations. Once paired, bluetooth works extremely well. The pairing process is obtuse and difficult to manage. 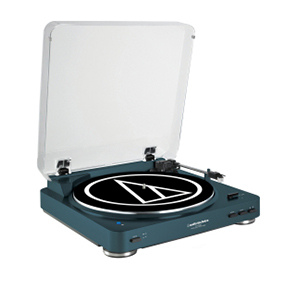 Although vinyl is back in a big way, Audio Technica is by no means new to the scene as they have been creating turntables and related technologies for over 50 years. Let’s take a look at how their entry-level effort performs. The AT-LP60-BT is, primarily, a very simple, elegant design which hearkens back to the heydey of record players with its sheer minimalism. Available in either matte black, navy blue, or white variations, this belt driven turntable features a rounded edge design that manages to appear both slender and compact as well as robust and sturdy. The clear plastic cover which is attached can be removed entirely or left open depending on what you’re going for. On the front panel, you’ll find just four buttons. These control speed (allowing you just the two options of 33-1/3 or 45 RPM), Start, Stop, and one labelled Cue which automatically raises and lowers the tonearm for you. As any enthusiast knows, vinyls are fairly delicate creatures by modern standards, and so it’s nice to have a button to deal with the potentially surface scratching, permanent damage that could come from a shaky hand of idle slip. On the left side of the platter, you’ll find a Bluetooth button which sits alone without much information about what you should do with it. As there is no screen, the pairing process is a little complicated when you start out, although you will no doubt get the hang of it fairly quickly. Basically, a single press puts the turntable into pairing mode, and you then follow the same routine on the speakers you wish to pair and hope for the best. Via the included RCA output, you can also connect to wired speakers which is, as you would expect, a far simpler process. As far as features go, the Cue mechanism detailed above is probably the standout as it is not something which we see on a lot of turntables at this price range, and can certainly make a difference to an entry level consumer who doesn’t yet know how to get hands on with their vinyl collection. Once you have worked out the pairing process, the audio playback is really nice and makes the whole thing worth it. As long as the vinyl is of a decent quality, any good pair of speakers will provide a significant improvement over the native playback on offer through this device. The mechanism for automatically moving the tonearm worked flawlessly throughout all of our tests, each time placing the needle carefully into the lead groove and lifting and replacing it after the record had reached its conclusion. On the whole, the listening experience is very solid. It will depend on your own personal tastes whether the fact that it is easy to forget that you are listening to vinyl is a good thing or a bad thing, but other than occasional pops this could be MP3 for the most part. With the AT-LP60NV-BT, Audio Technica have managed to fundamentally innovate on their previous offering by adding a Bluetooth component that can make a big difference if it’s what you’re going for. Good sound, good features, and a good looking turntable.